The LiU Environmental Prize this year has been awarded to a project, not a person. 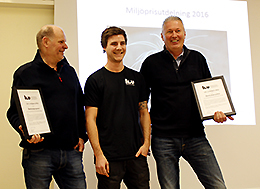 Three representatives for the Återbruket project received a diploma and the SEK 5,000 prize money. Three surprised and proud fellows received the LiU Environmental Prize for 2016. Micke Nilsson, Philip Nyström and Glenn Dahlberg all work with the Återbruket project, taking care of used furniture, IT equipment, office equipment and other items such that they can be reused. The aim of the project is to avoid as far as possible discarding anything. “Both the environment and the economy benefit,” as Micke Nilsson put it at the awards ceremony. Other universities have contacted Linköping University wanting to know how the project works. The LiU Environmental Prize has been awarded each year since 2007, making this year’s prize the tenth. The prize is awarded on alternate years to an employee and to a student or student organisation. The idea of a university-wide reuse system was born when it became apparent that fully functional items, everything from electronic components and computers to furniture, were being thrown away simply because routines and knowledge about how to take care of them at the university were lacking. The idea received financial backing from the fund for carbon offsetting, and carried out impressive work in 2015 to analyse the background and build up procedures. The reuse system was launched in the spring of 2016 on the university website, and at a physical location with the well structured storage of clearly labelled articles – all ready for reuse. Through the deep commitment, interest for environmental issues and professionalism shown by its personnel, Återbruket has spread its net widely at LiU and aroused a great deal of attention. Excellent work from which both the environment and the economy benefit.